The scutarius gladiator, was not a class as such but rather covered any gladiator that used a scutum shield. 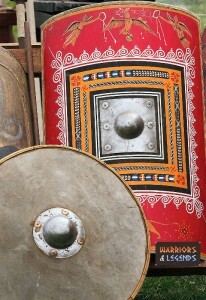 As this was the common and popular roman legionary shield, it was also popular with the gladiators. Because of this there were more scutarius gladiator classes than there were the opposing parmalarius class, who used a parma shield. The benefits of the scutum shield were many, it was big and strong, able to cover large portions of your body as well, meaning other body armour was not one hundred percent neccessary. However it also had negatives, the large size made it heavy too, making this class of gladiator potentially slower than a parmalarius. The term scutarius actually quite nicely translates to ‘sheild bearer’ which aptly describes any gladiator of this class or group. The plural for the scutarius gladiators was known as scutarii. A scutarius gladiator, using a slightly rounded edged scutum. Scutum is the latin word for shield, which shows how important this piece of armour was in Roman times. The scutum was the primary sheild for the Roman legionary who used it to effetively create the roman tortiose formation, famous for its huge levels of protection to a unit. The scutum was large for a shield, and typically rectangular in shape, but could be rounded at the edges or even more of an oval shape. 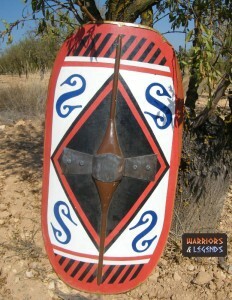 Typically this sheild could be heavy, about 10 kilograms, which converts to about 22 lbs, and its size was around 100cm by 40 cm, which converts to about 40 inches by 16 inches in size. 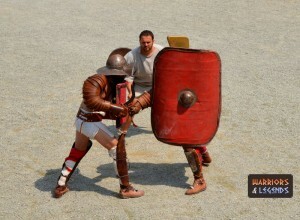 Light for its level of protection and size the scutum was very effective at defending its owner. The centre of the sheild house a metal boss, which also made the shield a melee weapon should the weilder choose to use it to slam them foe. A rectangular scutum on display here, again common with scutarius gladiators. As we already mentioned the scutalarius gladiators did not need as much armour as others, because of the large area of protection the scutum offered, however this was not always the case, and many scutarius gladiators had other armour to protect them. For example the secutor often wore a leg greave on their sheild leg, even though they bore a scutum, which was also similar with a murmillo too. A roman scutum, the shield of all the scutarius gladiators. This particular scutum is rounded at the edges.